Inertial confinement fusion (ICF) is a type of fusion energy research that attempts to initiate nuclear fusion reactions by heating and compressing a fuel target, typically in the form of a pellet that most often contains a mixture of deuterium and tritium. Typical fuel pellets are about the size of a pinhead and contain around 10 milligrams of fuel. To compress and heat the fuel, energy is delivered to the outer layer of the target using high-energy beams of laser light, electrons or ions, although for a variety of reasons, almost all ICF devices as of 2015[update] have used lasers. The heated outer layer explodes outward, producing a reaction force against the remainder of the target, accelerating it inwards, compressing the target. This process is designed to create shock waves that travel inward through the target. A sufficiently powerful set of shock waves can compress and heat the fuel at the center so much that fusion reactions occur. ICF is one of two major branches of fusion energy research, the other being magnetic confinement fusion. When it was first proposed in the early 1970s, ICF appeared to be a practical approach to power production and the field flourished. Experiments during the 1970s and '80s demonstrated that the efficiency of these devices was much lower than expected, and reaching ignition would not be easy. 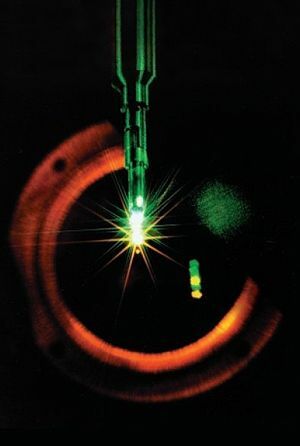 Throughout the 1980s and '90s, many experiments were conducted in order to understand the complex interaction of high-intensity laser light and plasma. These led to the design of newer machines, much larger, that would finally reach ignition energies. The largest operational ICF experiment is the National Ignition Facility (NIF) in the US, designed using the decades-long experience of earlier experiments. Like those earlier experiments, however, NIF has failed to reach ignition and is, as of 2015, generating about ​1⁄3 of the required energy levels. Indirect drive laser ICF uses a hohlraum which is irradiated with laser beam cones from either side on its inner surface to bathe a fusion microcapsule inside with smooth high intensity X-rays. The highest energy X-rays can be seen leaking through the hohlraum, represented here in orange/red. Nuclei are positively charged, and thus repel each other due to the electrostatic force. Overcoming this repulsion costs a considerable amount of energy, which is known as the Coulomb barrier or fusion barrier energy. Generally, less energy will be needed to cause lighter nuclei to fuse, as they have less charge and thus a lower barrier energy, and when they do fuse, more energy will be released. As the mass of the nuclei increase, there is a point where the reaction no longer gives off net energy—the energy needed to overcome the energy barrier is greater than the energy released in the resulting fusion reaction. The best fuel from an energy perspective is a one-to-one mix of deuterium and tritium; both are heavy isotopes of hydrogen. The D-T (deuterium & tritium) mix has a low barrier because of its high ratio of neutrons to protons. The presence of neutral neutrons in the nuclei helps pull them together via the nuclear force, while the presence of positively charged protons pushes the nuclei apart via electrostatic force. Tritium has one of the highest ratios of neutrons to protons of any stable or moderately unstable nuclide—two neutrons and one proton. Adding protons or removing neutrons increases the energy barrier. A mix of D-T at standard conditions does not undergo fusion; the nuclei must be forced together before the nuclear force can pull them together into stable collections. Even in the hot, dense center of the sun, the average proton will exist for billions of years before it fuses. For practical fusion power systems, the rate must be dramatically increased by heating the fuel to tens of millions of degrees, and/or compressing it to immense pressures. The temperature and pressure required for any particular fuel to fuse is known as the Lawson criterion. These conditions have been known since the 1950s when the first H-bombs were built. To meet the Lawson Criterion is extremely difficult on Earth, which explains why fusion research has taken many years to reach the current high state of technical prowess. In a hydrogen bomb, the fusion fuel is compressed and heated with a separate fission bomb (see Teller-Ulam design). A variety of mechanisms transfers the energy of the fission "primary" explosion into the fusion fuel. A primary mechanism is that the flash of x-rays given off by the primary is trapped within the engineered case of the bomb, causing the volume between the case and the bomb to fill with an x-ray "gas". These x-rays evenly illuminate the outside of the fusion section, the "secondary", rapidly heating it until it explodes outward. This outward blowoff causes the rest of the secondary to be compressed inward until it reaches the temperature and density where fusion reactions begin. The requirement of a fission bomb makes the method impractical for power generation. Not only would the triggers be prohibitively expensive to produce, but there is a minimum size that such a bomb can be built, defined roughly by the critical mass of the plutonium fuel used. Generally it seems difficult to build nuclear devices smaller than about 1 kiloton in yield, and the fusion secondary would add to this. This makes it a difficult engineering problem to extract power from the resulting explosions; the Project PACER studies solutions to the engineering issues, but also demonstrated the cost was simply not economically feasible. One of the PACER participants, John Nuckolls, began to explore what happened to the size of the primary required to start the fusion reaction as the size of the secondary was scaled down. He discovered that as the secondary reaches the miligram size, the amount of energy needed to spark it fell into the megajoule range. This was far below what was needed for a bomb, where the primary was in the terajoule range, the equivalent of about 6 ounces of TNT. This would not be economically feasible, such a device would cost more than the value of the electricity it produced. However, there were any number of other devices that might be able to repeatedly deliver this sort of energy level. This led to the idea of using a device that would "beam" the energy at the fusion fuel, ensuring mechanical separation. By the mid-1960s, it appeared that the laser would develop to the point where the required energy levels would be available. Generally ICF systems use a single laser, the driver, whose beam is split up into a number of beams which are subsequently individually amplified by a trillion times or more. These are sent into the reaction chamber (called a target chamber) by a number of mirrors, positioned in order to illuminate the target evenly over its whole surface. The heat applied by the driver causes the outer layer of the target to explode, just as the outer layers of an H-bomb's fuel cylinder do when illuminated by the X-rays of the fission device. The material exploding off the surface causes the remaining material on the inside to be driven inwards with great force, eventually collapsing into a tiny near-spherical ball. In modern ICF devices the density of the resulting fuel mixture is as much as one-hundred times the density of lead, around 1000 g/cm3. This density is not high enough to create any useful rate of fusion on its own. However, during the collapse of the fuel, shock waves also form and travel into the center of the fuel at high speed. When they meet their counterparts moving in from the other sides of the fuel in the center, the density of that spot is raised much further. Given the correct conditions, the fusion rate in the region highly compressed by the shock wave can give off significant amounts of highly energetic alpha particles. Due to the high density of the surrounding fuel, they move only a short distance before being "thermalised", losing their energy to the fuel as heat. This additional energy will cause additional fusion reactions in the heated fuel, giving off more high-energy particles. This process spreads outward from the centre, leading to a kind of self-sustaining burn known as ignition. Laser beams or laser-produced X-rays rapidly heat the surface of the fusion target, forming a surrounding plasma envelope. Fuel is compressed by the rocket-like blowoff of the hot surface material. During the final part of the capsule implosion, the fuel core reaches 20 times the density of lead and ignites at 100,000,000 ˚C. Thermonuclear burn spreads rapidly through the compressed fuel, yielding many times the input energy. In order to focus the shock wave on the center of the target, the target must be made with extremely high precision and sphericity with aberrations of no more than a few micrometres over its surface (inner and outer). Likewise the aiming of the laser beams must be extremely precise and the beams must arrive at the same time at all points on the target. Beam timing is a relatively simple issue though and is solved by using delay lines in the beams' optical path to achieve picosecond levels of timing accuracy. The other major problem plaguing the achievement of high symmetry and high temperatures/densities of the imploding target are so called "beam-beam" imbalance and beam anisotropy. These problems are, respectively, where the energy delivered by one beam may be higher or lower than other beams impinging on the target and of "hot spots" within a beam diameter hitting a target which induces uneven compression on the target surface, thereby forming Rayleigh-Taylor instabilities in the fuel, prematurely mixing it and reducing heating efficacy at the time of maximum compression. The Richtmyer-Meshkov instability is also formed during the process due to shock waves being formed. An Inertial confinement fusion target, which was a foam filled cylindrical target with machined perturbations, being compressed by the Nova Laser. This shot was done in 1995. The image shows the compression of the target, as well as the growth of the Rayleigh-Taylor instabilities. All of these problems have been substantially mitigated to varying degrees in the past two decades of research by using various beam smoothing techniques and beam energy diagnostics to balance beam to beam energy; however, RT instability remains a major issue. Target design has also improved tremendously over the years. Modern cryogenic hydrogen ice targets tend to freeze a thin layer of deuterium just on the inside of a plastic sphere while irradiating it with a low power IR laser to smooth its inner surface while monitoring it with a microscope equipped camera, thereby allowing the layer to be closely monitored ensuring its "smoothness". Cryogenic targets filled with a deuterium tritium (D-T) mixture are "self-smoothing" due to the small amount of heat created by the decay of the radioactive tritium isotope. This is often referred to as "beta-layering". Mockup of a gold plated National Ignition Facility (NIF) hohlraum. An inertial confinement fusion fuel microcapsule (sometimes called a "microballoon") of the size to be used on the NIF which can be filled with either deuterium and tritium gas or DT ice. The capsule can be either inserted in a hohlraum (as above) and imploded in the indirect drive mode or irradiated directly with laser energy in the direct drive configuration. Microcapsules used on previous laser systems were significantly smaller owing to the less powerful irradiation earlier lasers were capable of delivering to the target. Inertial confinement fusion history can be traced back to the "Atoms For Peace" conference held in 1957 in Geneva. This was a large, international UN sponsored conference between the superpowers of the US and Russia. Among the many topics covered during the event, some thought was given to using a hydrogen bomb to heat a water-filled underground cavern. The resulting steam would then be used to power conventional generators, and thereby provide electrical power. This meeting led to the Operation Plowshare efforts, given this name in 1961. Three primary concepts were studied as part of Plowshare; energy generation under Project PACER, the use of large nuclear explosions for excavation, and as a sort of nuclear fracking for the natural gas industry. PACER was directly tested in December 1961 when the 3 kt Project Gnome device was emplaced in bedded salt in New Mexico. In spite of all theorizing and attempts to stop it, radioactive steam was released from the drill shaft, some distance from the test site. Further studies as part of PACER led to a number of engineered cavities replacing natural ones, but through this period the entire Plowshare efforts turned from bad to worse, especially after the failure of 1962's Sedan which released huge quantities of fallout. PACER nevertheless continued to receive some funding until 1975, when a 3rd party study demonstrated that the cost of electricity from PACER would be the equivalent to conventional nuclear plants with fuel costs over ten times as great as they were. Another outcome of the "Atoms For Peace" conference was to prompt John Nuckolls to start considering what happens on the fusion side of the bomb. When A fission bomb explodes, it releases X-Rays, which implodes the fusion side. This "secondary," was scaled down to very small size. His earliest work concerned the study of how small a fusion bomb could be made while still having a large "gain" to provide net energy output. This work suggested that at very small sizes, on the order of milligrams, very little energy would be needed to ignite it, much less than a fission "primary". He proposed building, in effect, tiny all-fusion explosives using a tiny drop of D-T fuel suspended in the center of a metal shell, today known as a hohlraum. The shell provided the same effect as the bomb casing in an H-bomb, trapping x-rays inside so they irradiate the fuel. The main difference is that the x-rays would not be supplied by a primary within the shell, but some sort of external device that heated the shell from the outside until it was glowing in the x-ray region (see thermal radiation). The power would be delivered by a then-unidentified pulsed power source he referred to using bomb terminology, the "primary". The main advantage to this scheme is the efficiency of the fusion process at high densities. According to the Lawson criterion, the amount of energy needed to heat the D-T fuel to break-even conditions at ambient pressure is perhaps 100 times greater than the energy needed to compress it to a pressure that would deliver the same rate of fusion. So, in theory, the ICF approach would be dramatically more efficient in terms of gain. This can be understood by considering the energy losses in a conventional scenario where the fuel is slowly heated, as in the case of magnetic fusion energy; the rate of energy loss to the environment is based on the temperature difference between the fuel and its surroundings, which continues to increase as the fuel is heated. In the ICF case, the entire hohlraum is filled with high-temperature radiation, limiting losses. Around the same time (in 1956) a meeting was organized at the Max Planck Institute in Germany by the fusion pioneer Carl Friedrich von Weizsäcker. At this meeting Friedwardt Winterberg proposed the non-fission ignition of a thermonuclear micro-explosion by a convergent shock wave driven with high explosives. Further reference to Winterberg's work in Germany on nuclear micro explosions (mininukes) is contained in a declassified report of the former East German Stasi (Staatsicherheitsdienst). In 1964 Winterberg proposed that ignition could be achieved by an intense beam of microparticles accelerated to a velocity of 1000 km/s. And in 1968, he proposed to use intense electron and ion beams, generated by Marx generators, for the same purpose. The advantage of this proposal is that the generation of charged particle beams is not only less expensive than the generation of laser beams but also can entrap the charged fusion reaction products due to the strong self-magnetic beam field, drastically reducing the compression requirements for beam ignited cylindrical targets. In 1967 research fellow Gurgen Askaryan published article with proposition to use focused laser beam in fusion lithium deuteride or deuterium. Through the late 1950s, Nuckolls and collaborators at the Lawrence Livermore National Laboratory (LLNL) ran a number of computer simulations of the ICF concept. In early 1960 this produced a full simulation of the implosion of 1 mg of D-T fuel inside a dense shell. The simulation suggested that a 5 MJ power input to the hohlraum would produce 50 MJ of fusion output, a gain of 10. At the time the laser had not yet been invented, and a wide variety of possible drivers were considered, including pulsed power machines, charged particle accelerators, plasma guns, and hypervelocity pellet guns. Through the year two key theoretical advances were made. New simulations considered the timing of the energy delivered in the pulse, known as "pulse shaping", leading to better implosion. Additionally, the shell was made much larger and thinner, forming a thin shell as opposed to an almost solid ball. These two changes dramatically increased the efficiency of the implosion, and thereby greatly lowered the energy required to compress it. Using these improvements, it was calculated that a driver of about 1 MJ would be needed, a five-fold improvement. Over the next two years several other theoretical advancements were proposed, notably Ray Kidder's development of an implosion system without a hohlraum, the so-called "direct drive" approach, and Stirling Colgate and Ron Zabawski's work on very small systems with as little as 1 μg of D-T fuel. The introduction of the laser in 1960 at Hughes Research Laboratories in California appeared to present a perfect driver mechanism. Starting in 1962, Livermore's director John S. Foster, Jr. and Edward Teller began a small-scale laser study effort directed toward the ICF approach. Even at this early stage the suitability of the ICF system for weapons research was well understood, and the primary reason for its ability to gain funding. Over the next decade, LLNL made several small experimental devices for basic laser-plasma interaction studies. In 1967 Kip Siegel started KMS Industries using the proceeds of the sale of his share of an earlier company, Conductron, a pioneer in holography. In the early 1970s he formed KMS Fusion to begin development of a laser-based ICF system. This development led to considerable opposition from the weapons labs, including LLNL, who put forth a variety of reasons that KMS should not be allowed to develop ICF in public. This opposition was funnelled through the Atomic Energy Commission, who demanded funding for their own efforts. Adding to the background noise were rumours of an aggressive Soviet ICF program, new higher-powered CO2 and glass lasers, the electron beam driver concept, and the 1970s energy crisis which added impetus to many energy projects. In 1972 Nuckolls wrote an influential public paper in Nature introducing ICF and suggesting that testbed systems could be made to generate fusion with drivers in the kJ range, and high-gain systems with MJ drivers. In spite of limited resources and numerous business problems, KMS Fusion successfully demonstrated fusion from the ICF process on 1 May 1974. However, this success was followed not long after by Siegel's death, and the end of KMS fusion about a year later, having run the company on Siegel's life insurance policy. By this point several weapons labs and universities had started their own programs, notably the solid-state lasers (Nd:glass lasers) at LLNL and the University of Rochester, and krypton fluoride excimer lasers systems at Los Alamos and the Naval Research Laboratory. Although KMS's success led to a major development effort, the advances that followed were, and still are, hampered by the seemingly intractable problems that characterize fusion research in general. High-energy ICF experiments (multi-hundred joules per shot and greater experiments) began in earnest in the early-1970s, when lasers of the required energy and power were first designed. This was some time after the successful design of magnetic confinement fusion systems, and around the time of the particularly successful tokamak design that was introduced in the early '70s. Nevertheless, high funding for fusion research stimulated by the multiple energy crises during the mid to late 1970s produced rapid gains in performance, and inertial designs were soon reaching the same sort of "below break-even" conditions of the best magnetic systems. LLNL was, in particular, very well funded and started a major laser fusion development program. Their Janus laser started operation in 1974, and validated the approach of using Nd:glass lasers to generate very high power devices. Focusing problems were explored in the Long path laser and Cyclops laser, which led to the larger Argus laser. None of these were intended to be practical ICF devices, but each one advanced the state of the art to the point where there was some confidence the basic approach was valid. At the time it was believed that making a much larger device of the Cyclops type could both compress and heat the ICF targets, leading to ignition in the "short term". This was a misconception based on extrapolation of the fusion yields seen from experiments utilizing the so-called "exploding pusher" type of fuel capsules. During the period spanning the years of the late '70s and early '80s the estimates for laser energy on target needed to achieve ignition doubled almost yearly as the various plasma instabilities and laser-plasma energy coupling loss modes were gradually understood. The realization that the simple exploding pusher target designs and mere few kilojoule (kJ) laser irradiation intensities would never scale to high gain fusion yields led to the effort to increase laser energies to the 100 kJ level in the UV and to the production of advanced ablator and cryogenic DT ice target designs. One of the earliest serious and large scale attempts at an ICF driver design was the Shiva laser, a 20-beam neodymium doped glass laser system built at the (LLNL) that started operation in 1978. Shiva was a "proof of concept" design intended to demonstrate compression of fusion fuel capsules to many times the liquid density of hydrogen. In this, Shiva succeeded and compressed its pellets to 100 times the liquid density of deuterium. However, due to the laser's strong coupling with hot electrons, premature heating of the dense plasma (ions) was problematic and fusion yields were low. This failure by Shiva to efficiently heat the compressed plasma pointed to the use of optical frequency multipliers as a solution which would frequency triple the infrared light from the laser into the ultraviolet at 351 nm. Newly discovered schemes to efficiently frequency triple high intensity laser light discovered at the Laboratory for Laser Energetics in 1980 enabled this method of target irradiation to be experimented with in the 24 beam OMEGA laser and the NOVETTE laser, which was followed by the Nova laser design with 10 times the energy of Shiva, the first design with the specific goal of reaching ignition conditions. Nova also failed in its goal of achieving ignition, this time due to severe variation in laser intensity in its beams (and differences in intensity between beams) caused by filamentation which resulted in large non-uniformity in irradiation smoothness at the target and asymmetric implosion. The techniques pioneered earlier could not address these new issues. But again this failure led to a much greater understanding of the process of implosion, and the way forward again seemed clear, namely the increase in uniformity of irradiation, the reduction of hot-spots in the laser beams through beam smoothing techniques to reduce Rayleigh–Taylor instabilities imprinting on the target and increased laser energy on target by at least an order of magnitude. Funding for fusion research was severely constrained in the 80's, but Nova nevertheless successfully gathered enough information for a next generation machine. The resulting design, now known as the National Ignition Facility, started construction at LLNL in 1997. NIF's main objective will be to operate as the flagship experimental device of the so-called nuclear stewardship program, supporting LLNLs traditional bomb-making role. Completed in March 2009, NIF has now conducted experiments using all 192 beams, including experiments that set new records for power delivery by a laser. The first credible attempts at ignition were initially scheduled for 2010, but ignition was not achieved as of September 30, 2012. As of October 7, 2013, the facility is understood to have achieved an important milestone towards commercialization of fusion, namely, for the first time a fuel capsule gave off more energy than was applied to it. This is still a long way from satisfying the Lawson criterion, but is a major step forward. A more recent development is the concept of "fast ignition," which may offer a way to directly heat the high density fuel after compression, thus decoupling the heating and compression phases of the implosion. In this approach the target is first compressed "normally" using a driver laser system, and then when the implosion reaches maximum density (at the stagnation point or "bang time"), a second ultra-short pulse ultra-high power petawatt (PW) laser delivers a single pulse focused on one side of the core, dramatically heating it and hopefully starting fusion ignition. The two types of fast ignition are the "plasma bore-through" method and the "cone-in-shell" method. In the first method the petawatt laser is simply expected to bore straight through the outer plasma of an imploding capsule and to impinge on and heat the dense core, whereas in the cone-in-shell method, the capsule is mounted on the end of a small high-z (high atomic number) cone such that the tip of the cone projects into the core of the capsule. In this second method, when the capsule is imploded, the petawatt has a clear view straight to the high density core and does not have to waste energy boring through a 'corona' plasma; however, the presence of the cone affects the implosion process in significant ways that are not fully understood. Several projects are currently underway to explore the fast ignition approach, including upgrades to the OMEGA laser at the University of Rochester, the GEKKO XII device in Japan, and an entirely new £500 million facility, known as HiPER, proposed for construction in the European Union. If successful, the fast ignition approach could dramatically lower the total amount of energy needed to be delivered to the target; whereas NIF uses UV beams of 2 MJ, HiPER's driver is 200 kJ and heater 70 kJ, yet the predicted fusion gains are nevertheless even higher than on NIF. Laser Mégajoule, the French project, has seen its first experimental line achieved in 2002, and its first target shots were finally conducted in 2014. The machine was roughly 75% complete as of 2016. Using a different approach entirely is the z-pinch device. Z-pinch uses massive amounts of electric current which is switched into a cylinder comprising extremely fine wires. The wires vaporize to form an electrically conductive, high current plasma; the resulting circumferential magnetic field squeezes the plasma cylinder, imploding it and thereby generating a high-power x-ray pulse that can be used to drive the implosion of a fuel capsule. Challenges to this approach include relatively low drive temperatures, resulting in slow implosion velocities and potentially large instability growth, and preheat caused by high-energy x-rays. Most recently, Winterberg has proposed the ignition of a deuterium microexplosion, with a gigavolt super-Marx generator, which is a Marx generator driven by up to 100 ordinary Marx generators. IFE faces continued technical challenges in reaching the conditions needed for ignition. But even if these were all to be solved, there are a significant number of practical problems that seem just as difficult to overcome. Laser-driven systems were initially believed to be able to generate commercially useful amounts of energy. However, as estimates of the energy required to reach ignition grew dramatically during the 1970s and '80s, these hopes were abandoned. Given the low efficiency of the laser amplification process (about 1 to 1.5%), and the losses in generation (steam-driven turbine systems are typically about 35% efficient), fusion gains would have to be on the order of 350 just to energetically break even. These sorts of gains appeared to be impossible to generate, and ICF work turned primarily to weapons research. With the recent introduction of fast ignition and similar approaches, things have changed dramatically. In this approach gains of 100 are predicted in the first experimental device, HiPER. Given a gain of about 100 and a laser efficiency of about 1%, HiPER produces about the same amount of fusion energy as electrical energy was needed to create it. It also appears that an order of magnitude improvement in laser efficiency may be possible through the use of newer designs that replace the flash lamps with laser diodes that are tuned to produce most of their energy in a frequency range that is strongly absorbed. Initial experimental devices offer efficiencies of about 10%, and it is suggested that 20% is a real possibility with some additional development. With "classical" devices like NIF about 330 MJ of electrical power are used to produce the driver beams, producing an expected yield of about 20 MJ, with the maximum credible yield of 45 MJ. Using the same sorts of numbers in a reactor combining fast ignition with newer lasers would offer dramatically improved performance. HiPER requires about 270 kJ of laser energy, so assuming a first-generation diode laser driver at 10% the reactor would require about 3 MJ of electrical power. This is expected to produce about 30 MJ of fusion power. Even a very poor conversion to electrical energy appears to offer real-world power output, and incremental improvements in yield and laser efficiency appear to be able to offer a commercially useful output. One current concept in dealing with both of these problems, as shown in the HYLIFE-II baseline design, is to use a "waterfall" of FLiBe, a molten mix of fluoride salts of lithium and beryllium, which both protect the chamber from neutrons and carry away heat. The FLiBe is then passed into a heat exchanger where it heats water for use in the turbines. The tritium produced by fissioning lithium nuclei can also be extracted in order to close the power plant's thermonuclear fuel cycle, a necessity for perpetual operation because tritium does not exist in quantity naturally and must be manufactured. Another concept, Sombrero, uses a reaction chamber built of Carbon-fiber-reinforced polymer which has a very low neutron cross section. Cooling is provided by a molten ceramic, chosen because of its ability to stop the neutrons from traveling any further, while at the same time being an efficient heat transfer agent. An inertial confinement fusion implosion in Nova, creating "micro sun" conditions of tremendously high density and temperature rivalling even those found at the core of our Sun. Thus, in order for an IFE plant to be economically viable, fuel shots would have to cost considerably less than ten cents in year 2012 dollars. At the time this objection was first noted, Nuckolls suggested using liquid droplets sprayed into the hohlraum from an eye-dropper-like apparatus. Given the ever-increasing demands for higher uniformity of the targets, this approach does not appear practical, as even the inner ablator and fuel itself currently costs several orders of magnitude more than this. Moreover, Nuckolls' solution had the fuel dropped into a fixed hohlraum that would be re-used in a continual cycle, but at current energy levels the hohlraum is destroyed with every shot. Direct-drive systems avoid the use of a hohlraum and thereby may be less expensive in fuel terms. However, these systems still require an ablator, and the accuracy and geometrical considerations are even more important. They are also far less developed than the indirect-drive systems, and face considerably more technical problems in terms of implosion physics. Currently there is no strong consensus whether a direct-drive system would actually be less expensive to operate. Reproducible achievement of some fusion energy release (not necessarily a Q factor of >1). Experimental demonstration of the feasibility of a reactor with a sufficient energy gain. Validation of the various technical options, and of the whole data needed to define a commercial reactor. Demonstration of the reactor ability to work over a long period, while respecting all the requirements for safety, liability and cost. At the moment, according to the available data, inertial confinement fusion experiments have not gone beyond the first phase, although Nova and others have repeatedly demonstrated operation within this realm. In the short term a number of new systems are expected to reach the second stage. R&D continued on inertial fusion energy in the European Union and in Japan. The High Power laser Energy Research (HiPER) facility is a proposed experimental fusion device undergoing preliminary design for possible construction in the European Union to continue the development of laser-driven inertial confinement approach. HiPER is the first experiment designed specifically to study the fast ignition approach to generating nuclear fusion. Using much smaller lasers than conventional designs, yet produces fusion power outputs of about the same magnitude would offer a much higher Q with a reduction in construction costs of about ten times. Theoretical research since the design of HiPER in the early 2000s has cast doubt on fast ignition but a new approach known as shock ignition has been proposed to address some of these problems. Japan developed the KOYO-F fusion reactor design and laser inertial fusion test (LIFT) experimental reactor. In April 2017, Bloomberg News reported that Mike Cassidy, former Google vice-president and director of Project Loon with Google[x], started a clean energy startup, Apollo Fusion, to develop a hybrid fusion-fission reactor technology. The very hot and dense conditions encountered during an Inertial Confinement Fusion experiment are similar to those created in a thermonuclear weapon, and have applications to the nuclear weapons program. ICF experiments might be used, for example, to help determine how warhead performance will degrade as it ages, or as part of a program of designing new weapons. Retaining knowledge and corporate expertise in the nuclear weapons program is another motivation for pursuing ICF. 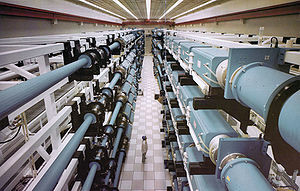 Funding for the NIF in the United States is sourced from the 'Nuclear Weapons Stockpile Stewardship' program, and the goals of the program are oriented accordingly. It has been argued that some aspects of ICF research may violate the Comprehensive Test Ban Treaty or the Nuclear Non-Proliferation Treaty. In the long term, despite the formidable technical hurdles, ICF research might potentially lead to the creation of a "pure fusion weapon". Inertial confinement fusion has the potential to produce orders of magnitude more neutrons than spallation. Neutrons are capable of locating hydrogen atoms in molecules, resolving atomic thermal motion and studying collective excitations of photons more effectively than X-rays. Neutron scattering studies of molecular structures could resolve problems associated with protein folding, diffusion through membranes, proton transfer mechanisms, dynamics of molecular motors, etc. by modulating thermal neutrons into beams of slow neutrons. In combination with fissionable materials, neutrons produced by ICF can potentially be used in Hybrid Nuclear Fusion designs to produce electric power. Leonardo Mascheroni, who proposed using hydrogen fluoride lasers to achieve fusion. Bubble fusion, a phenomenon claimed – controversially – to provide an acoustic form of inertial confinement fusion. ^ Blackburn, T. G.; Ridgers, C. P.; Kirk, J. G.; Bell, A. R. (7 January 2014). "Quantum Radiation Reaction in Laser–Electron-Beam Collisions". Physical Review Letters. 112 (1): 055001. arXiv:1503.01009. Bibcode:2014PhRvL.112a5001B. doi:10.1103/PhysRevLett.112.015001. PMID 24483905. ^ "FusEdWeb | Fusion Education". Fusedweb.llnl.gov. Archived from the original on 2013-05-10. Retrieved 2013-10-11. ^ Hoffman, Mark (2013-03-23). "What Is The Lawson Criteria, Or How to Make Fusion Power Viable". Scienceworldreport.com. Retrieved 2014-08-23. ^ Hayes, A. C.; Jungman, G.; Solem, J. C.; Bradley, P. A.; Rundberg, R. S. (2006). "Prompt beta spectroscopy as a diagnostic for mix in ignited NIF capsules". Modern Physics Letters A. 21 (13): 1029. arXiv:physics/0408057. Bibcode:2006MPLA...21.1029H. doi:10.1142/S0217732306020317. ^ Hsing, Warren W.; Hoffman, Nelson M. (May 1997). "Measurement of Feedthrough and Instability Growth in Radiation-Driven Cylindrical Implosions". Physical Review Letters. 78 (20): 3876–3879. doi:10.1103/PhysRevLett.78.3876. ^ a b Nuckolls 1998, p. 1. ^ F.A. Long, "Peaceful nuclear explosions", Bulletin of the Atomic Scientists, October 1976, pp. 24-25. ^ a b Nuckolls 1998, p. 2. ^ Nuckolls 1998, p. 3. ^ Gurgen Askaryan (1967). Новые физические эффекты [New Physical Effects]. Nauka i Zhizn (in Russian). 11: 105. ^ Nuckolls 1998, p. 4. ^ a b Nuckolls 1998, p. 5. ^ Nuckolls 1998, pp. 4-5. ^ a b Nuckolls 1998, p. 6. ^ Wyatt, Philip (December 2009). "The Back Page". Aps.org. Retrieved 2014-08-23. ^ Hirschfeld, Bob (March 31, 2009). "DOE announces completion of world's largest laser". Publicaffairs.llnl.gov. Archived from the original on May 27, 2010. Retrieved 2014-08-23. ^ Jason Palmer (2010-01-28). "Laser fusion test results raise energy hopes". BBC News. Retrieved 2010-01-28. ^ "Initial NIF experiments meet requirements for fusion ignition". Lawrence Livermore National Laboratory. 2010-01-28. Archived from the original on 2010-05-27. Retrieved 2010-01-28. ^ William J. Broad. "So Far Unfruitful, Fusion Project Faces a Frugal Congress". ^ Philip Ball (12 February 2014). "Laser fusion experiment extracts net energy from fuel". Nature. pp. 12–27. doi:10.1038/nature.2014.14710. Retrieved 2014-02-13. ^ Grabovskii, E. V. (2002). Fast Z - Pinch Study in Russia and Related Problems. DENSE Z-PINCHES: 5th International Conference on Dense Z-Pinches. AIP Conference Proceedings. 651. pp. 3–8. Bibcode:2002AIPC..651....3G. doi:10.1063/1.1531270. ^ Winterberg, Friedwardt (2008-12-01). "Ignition of a deuterium micro-detonation with a gigavolt super marx generator". arXiv:0812.0394 [physics.gen-ph]. ^ "IESO Power Data". Ieso.ca. Archived from the original on 2014-10-02. Retrieved 2014-08-23. ^ This chapter is based on data available in June 2006, when Laser Megajoule and NIF lasers are not yet into complete service. ^ Perkins, L. J.; Betti, R.; LaFortune, K. N.; Williams, W. H. (2009). "Shock Ignition: A New Approach to High Gain Inertial Confinement Fusion on the National Ignition Facility" (PDF). Physical Review Letters. 103 (4): 045004. Bibcode:2009PhRvL.103d5004P. doi:10.1103/PhysRevLett.103.045004. ^ HiPER Project Team (1 December 2013). HiPER Preparatory Phase Completion Report (PDF) (Report). Retrieved 1 May 2017. ^ Ribeyre, X.; Schurtz, G.; Lafon, M.; Galera, S.; Weber, S. (2009). "Shock ignition: an alternative scheme for HiPER". Plasma Physics and Controlled Fusion. 51 (1): 015013. Bibcode:2009PPCF...51a5013R. doi:10.1088/0741-3335/51/1/015013. ISSN 0741-3335. ^ Norimatsu, Takayoshi; Kozaki, Yasuji; Shiraga, Hiroshi; Fujita, Hisanori; Okano, Kunihiko; Azech, Hiroshi (2013). "Laser Fusion Experimental Reactor LIFT Based on Fast Ignition and the Issue". CLEO: 2013 (2013), Paper ATh4O.3. Optical Society of America: ATh4O.3. doi:10.1364/CLEO_AT.2013.ATh4O.3. ISBN 978-1-55752-972-5. ^ Norimatsu, T.; Kawanaka, J.; Miyanaga, M.; Azechi, H. (2007). "Conceptual Design of Fast Ignition Power Plant KOYO-F Driven by Cooled Yb:YAG Ceramic Laser". Fusion Science and Technology. 52 (4): 893–900. doi:10.13182/fst52-893. ^ Norimatsu, T. (2006). "Fast ignition Laser Fusion Reactor KOYO-F - Summary from design committee of FI laser fusion reactor" (PDF). US-Japan workshop on Power Plant Studies and related Advanced Technologies with EU participation (24-25 January 2006, San Diego, CA). ^ Stone, Brad (3 April 2017). "Former Google Vice President Starts a Company Promising Clean and Safe Nuclear Energy". Bloomberg.com. Retrieved 2017-05-01. ^ Thompson, Avery (3 April 2017). "Can a Googler's Fusion Startup Kickstart Nuclear Power?". Popular Mechanics. Retrieved 2017-05-01. ^ "Science". Lasers.llnl.gov. Retrieved 2014-08-24. ^ "Stockpile Stewardship". Lasers.llnl.gov. Retrieved 2014-08-24. ^ Makhijani, Arjun; Zerriffi, Hisham (1998-07-15). "Dangerous Thermonuclear Quest". Ieer.org. Retrieved 2014-08-23. Nuckolls, John (1998). "Early Steps Toward Inertial Fusion Energy (IFE)" (PDF). Lawrence Livermore National Laboratory.